The passing of an iconic star always devastates fans, but given that Bowie was in the midst of a late-career renaissance, his death seemed unusually cruel. Adding unintended drama, he had released a new album, Blackstar, three days earlier, on his 69th birthday. Recorded with a group of jazz musicians, Blackstar had earned wildly positive reviews even before Bowie’s death gave it a sentimental gloss. 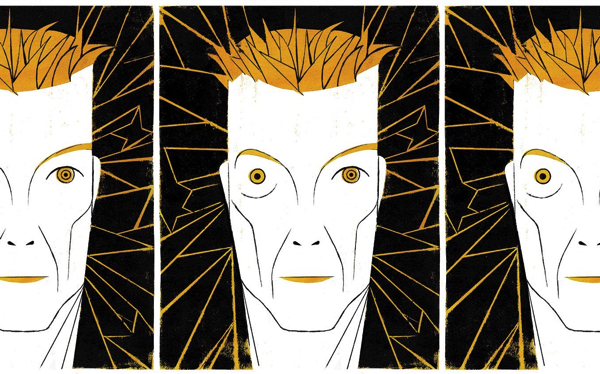 Lazarus, meanwhile, was a deeply personal work of musical theater — Bowie’s first as a creator. It was a sequel of sorts to the novel The Man Who Fell to Earth, about an alien stranded on Earth, a character that had obsessed Bowie since he played the part in Nicolas Roeg’s 1976 film adaptation. The show had instantly sold out its run, drawing rapturous audiences and mixed but respectful reviews. You normally can’t say that a 69-year-old man has been cut down in his prime, but maybe this time you could. Blackstar, Bowie’s 25th studio album, had followed a strong 24th — The Next Day, which came out in 2013. If Blackstar seemed shadowed by Bowie’s death, The Next Day consciously marked a rebirth. It was his first new music since 2003, ending a decade of silence in which he for the most part had kept out of public view, a sabbatical apparently prompted by an onstage heart attack in June 2004 in Prague. Bowie had recovered, but aside from rare appearances at charity or tribute concerts and a few small acting gigs, he seemed content to live quietly in downtown Manhattan with his wife, model Iman, and their daughter, Alexandria, now 16. It was almost as if he were emulating his old friend John Lennon, who had quit music for half a decade of house husbandry during the 1970s. The Next Day and Blackstar bookended a fertile four-year stretch, a creative run all the more remarkable given that over the previous year and a half Bowie was fighting the illness that would kill him. And yet, while his final works grapple with mortality and existential despair, madness, identity and violence, his collaborators knew him as an artist who was fully engaged and reveled in the sometimes sweaty work of making music and theater. By all accounts, this last act was as vital and joyous as it was haunting. 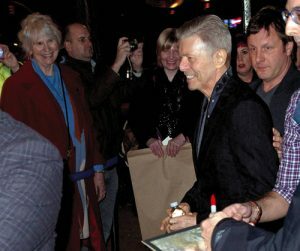 The last known picture of Bowie in public, attending Lazarus a month before he died. Interest and inspiration clearly had returned in force. In the fall of 2014, Hey received an email “from David’s people” asking if he could set aside a week to meet with Bowie on another secret project. It turned out to be Lazarus. Bowie had bought the stage rights to The Man Who Fell to Earth in 2005, but it wasn’t until 2013 that he got the project rolling in earnest. A producer friend introduced him to Irish playwright Enda Walsh, a Tony winner a year earlier for writing the book to the musical Once. Together they began to flesh out Bowie’s four-page treatment for a musical sequel — visiting the hero, Thomas Newton, 30 years later, still stranded on Earth, living on gin and Twinkies in a New York loft and confronting the downside of immortality. By the spring of 2014, things had progressed to the point that a director was needed, but Bowie was adamant that Lazarus be nothing like a conventional jukebox musical. One candidate was Ivo van Hove, an Amsterdam-based director known for innovative visual shows who then was represented on the West End by his revival of Arthur Miller’s A View From the Bridge, which later moved to Broadway. Three weeks later, van Hove flew to New York for a Saturday morning meeting at Bowie’s place on Lafayette Street. Bowie declined to reveal much about the project — not exactly coy in van Hove’s telling, maybe more cryptic or elliptical. Three weeks later, with Bowie apparently having approved of him, van Hove was back downtown, sitting with Bowie and Walsh but still in the dark. “That was the most scary moment for me in the whole process,” admits van Hove. “They didn’t give the script to me the day before. It was just there on the table, and then they started to read it” — aloud, the full first act, with Bowie playing all the characters. “Of course,” says van Hove, “I knew that they would ask afterward, ‘What do you think?’ What if I hated it?” Happily, he didn’t. Bowie, Schneider learned, was a lifelong jazz fan, an aficionado in particular of arranger Gil Evans, with whom Schneider had worked early in her career. Bowie would bring Schneider an unfinished song, and they’d sit side by side at the piano in her apartment bouncing ideas off each other as they developed what became “Sue (or in a Season of Crime).” The version recorded with Schneider’s orchestra — another would be cut during the Blackstar sessions — is a long, complex song with a brooding instrumental passage and lyrics that suggest a murder ballad as filtered through Bowie’s often splintering sensibility. Saxophonist Donny McCaslin is a member of Schneider’s group and leads his own quartet. He recalls that it took something like six hours in the studio to get an instrumental track for “Sue” that everyone liked. “At that point, David put down a scratch vocal,” says McCaslin, referring to the quick take a singer often will do to ensure the track’s timing and arrangement work before later returning to record a more polished vocal. “What was amazing about that was, I don’t remember him doing any vocal warmup. He sang a few notes, like 30 seconds for a mic check, and then did a scratch vocal from start to finish.” Bowie was 67 at the time, an age when most singers need to coddle their larynxes, and near the end of an already long day. “That was a tour de force vocally,” continues McCaslin. ” ‘Sue’ was almost nine minutes long!” More impressive, that scratch vocal ended up on the finished version, released as a track for Bowie’s 2014 career retrospective, Nothing Has Changed. Even before “Sue” was recorded, Bowie had told Schneider he wanted to collaborate further, but she was committed to making her own album. She suggested he work with McCaslin’s quartet, and she brought Bowie to see the group at 55 Bar, a basement jazz club in Greenwich Village. “I saw him out of the corner of my eye,” recalls McCaslin. 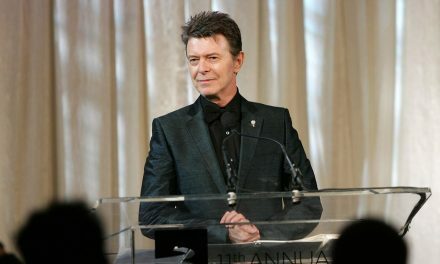 “I tried to stay focused on the music, but I knew there could be some kind of interesting outcome of him hearing us live.” Indeed, Bowie was impressed, and not long after they finally met at the “Sue” sessions, Bowie sent McCaslin an email proposing they record “two or three” songs together. By Visconti’s account, Bowie’s cancer had gone into remission by the middle of 2015. “Don’t celebrate too quickly,” Bowie reportedly said, hedging his bet. But if he didn’t often assert himself, Bowie enjoyed the process and camaraderie, sometimes hanging out with cast and crew long after formal work had ended. 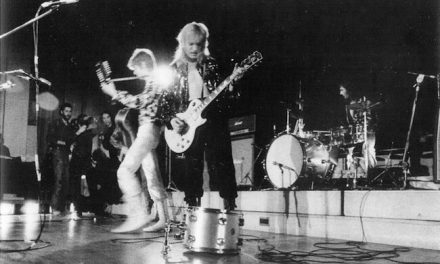 Hey recalls an early run-through of the show when, after the band finished, Hey asked Bowie, “Is everything OK? Would you like anything else?” “Yes,” replied Bowie. “I think I’d like a sing.” He and the band then performed the song “Lazarus” together. Bowie attended the Lazarus premiere Dec. 7, taking an onstage bow with a big smile on his face, but he was “very fragile,” according to van Hove, and didn’t have the energy to attend the opening-night party. A little more than a month later, he was dead, and the stunned cast was assembling to record their album. Michael C. Hall as Newton and Sophie Anne Caruso as Girl in David Bowie and Enda Walsh’s Lazarus directed by Ivo van Hove at the King’s Cross Theatre on Nov. 3, 2016, in London, England. McCaslin’s quartet was scheduled to open a weeklong stand at the Village Vanguard — its first at New York’s venerated jazz club — on the 19th, the night before Lazarus‘ final performance. It was a gig meant to celebrate the group’s contribution to Blackstar, but it now took on a more elegiac aura. As a tribute, they performed the Bowie song “Warszawa” (co-written with Brian Eno) during every set. You can hear a powerful, mournful, deeply felt take that grew out of those performances on McCaslin’s recently released album, Beyond Now.